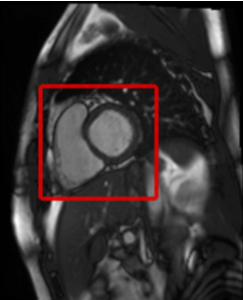 Cardiac MRI is the modality of choice in cardiology for the assessment of the ventricular function, since the heart’s anatomy is visualized with high resolution. This functional assessment is a time-consuming task for the cardiac radiologist when performed manually. Therefore, computer-driven diagnostic solutions are of particular importance for clinical applications. In order to ensure the success of such computer aided diagnosis algorithms however, a correct, initial localisation of the heart region in the raw data is crucial. For this purpose, we present a novel, simple and fully automated approach for localizing the heart region in cardiac cine MR data. Without the need for prior knowledge or training datasets, this method enables a ready to use application for a robust localization. This processing step is a fundamental component for the development of integrated automated applications.